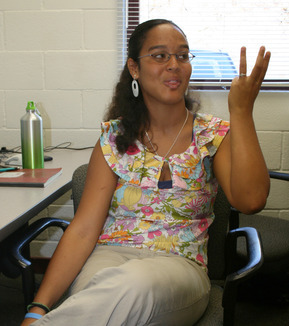 Marissa Loving grew up in Honomu on the Big Island of Hawai‘i as one of eleven children in a homeschooling family. She will be a sophomore this fall at the University of Hawai‘i at Hilo, where she is pursuing majors in Mathematics and Computer Science. When not occupied in furiously coding programs or typing up lengthy mathematical proofs, she enjoys swimming, turbo-kicking, and learning more math. After graduation, Marissa plans to pursue graduate studies in mathematics. The Gemini Observatory collects a huge amount of data concerning the current condition of the telescope and all of its related electrical and mechanical systems. This data facilitates the operation and ongoing maintenance of the observatory and is stored in a database known as the Gemini Engineering Archive (GEA). One such related system is the Gemini North Laser Guide Star (GN LGS), which plays an integral role in Gemini’s Adaptive Optics technology. A principal component of the GN LGS is the 14-watt, 589-nanometer laser itself. There are currently 78 channels of data recorded in GEA for this laser alone. My goal is to maximize the quality and potential usefulness of these laser parameters. Initially, I conducted a manual search of GEA to look for faults, such as missing or incorrect data. Once these basic issues were identified, the focus was to develop graphical displays that allow the most critical laser parameters to be accessed as efficiently as possible. A detailed report of the modifications to be made to GEA to eliminate errors and increase usability will be submitted to the Gemini Software Group for implementation. If a large number of improvements are identified for the GN laser, it would be worthwhile to conduct similar efficiency studies on the parameters being stored in GEA for other major Gemini systems.